Following a low-carb diet requires you to drastically reduce your intake of carbohydrate-rich foods, such as fruits, vegetables and grains. On a regular 2,000-calorie diet, you should consume between 225 and 325 g of carbs. Low-carb diets reduce your carbohydrates to 50 to 150 g. Popcorn does contain carbs, but cutting down your portion size can allow you to continue to enjoy this popular snack. Popcorn is a whole grain food made from a particular type of corn kernels. While there are several varieties of corn, only one type, zea mays everta, actually can pop, explains The Popcorn Board. Kernels are composed of three parts: the germ, endosperm and pericarp, or hull. The endosperm is rich in carbohydrates and provides energy to the germ for growth. These parts are protected by the outer pericarp, which is rich in cellulose, a type of fiber. Popcorn is a rich source of carbohydrates, but it does provide a small amount of protein as well. MyPyramid.com suggests consuming 3 to 4 oz. or equivalent of grain foods each day. While following a low-carb diet, you might want to cut those servings in half. Since popcorn is so light and airy, a 1 oz. equivalent of popcorn is 3 cups. This serving size has less than 20 g of carbs and about 3 g of protein. Low-carb diets tend to restrict high-fiber foods from your diet. Most of the carbohydrates in popcorn, about 75 percent, is starch. This type of carb breaks down quickly, giving you energy immediately. The remaining 25 percent of carbohydrates comes from fiber. Popcorn is a good source of insoluble fiber, which stays relatively intact in your gut and helps push through digested food, promoting regularity. In addition, insoluble fiber from popcorn takes longer to chew, allowing your body to register that it is full early on. This can help your weight-loss efforts, since you'll be less likely to overeat. Enjoying a serving of high-fiber popcorn in the afternoon can keep you satisfied until dinner. 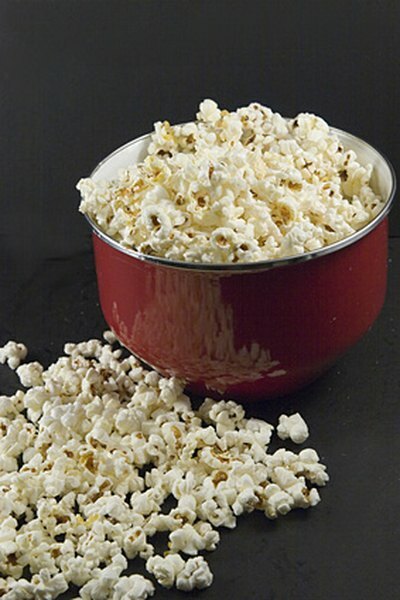 Air-popped popcorn is naturally low in fat and calories. Adding butter, oil or other toppings increases your intake of nutrients. Tossing popcorn in these fats does not increase the carbohydrate content, but it can double the amount of calories. A 3 cup serving of air-popped corn has about 1 g of fat, but adding butter or oil can pack on an additional 10 g or more. Keep your low-carb diet on track by snacking on plain air-popped popcorn. For flavor, sprinkle your snack with hot sauce, garlic powder or cinnamon. They add flavor without adding carbs, fat or calories. The Popcorn Board: What is Popcorn?